Jeff Martin needed a solution, and like most people looking for answers, he turned to the Internet. It was 2003, and Jeff—a Krav Maga brown belt and fifth-degree black belt—was running a boxing, kickboxing and martial-arts gym. Two guys who had just started training with Jeff approached him and said they really wanted him to set up a kickboxing match for them. The problem was they didn’t have much ring experience. Jeff knew that improving their technique would take months—maybe even years—of practice. The only way they might have a shot at doing well was if they could figure out a way to quickly improve their fitness. At the same time, Jeff was reaching his mid-40s and finding it harder and harder to maintain his fitness level. So he sat down in front of the computer and started researching. Eventually he stumbled across CrossFit.com. The short and brutal CrossFit workouts seemed strange to Jeff, but he thought he’d give it a try. To experience what he’d be asking his fighters to do, Jeff tested one of the workouts first. He figured it wouldn’t be too difficult because he was an experienced martial artist and gym owner. Crossfit will lead this country out of recession and into greatness for the same reason it dramatically impacts adults and kids. It provides clarity and meaning to fitness that is infinitely transitionable throughout the broad domains of life. Thank you Jeff and Mikki for having the fortitude and foresight to take Crossfit to a developing generation. Its much better than living in tents in front of financial institutions and pretending to make a difference. 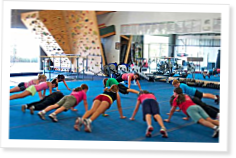 Has there been any thought to offering parent/child CrossFit classes? I know that some yoga studios do parent/child yoga. I ask this because my two-year-old is very interested in my CrossFitting. She does cute little pushups and gets half way up the wall on wall-climbs. I sometimes use her as a "kettlebell", which she really enjoys. Push-presses with two-year-old in your hands instead of a barbell can be a great workout. So, has any thought gone into this concept? With a parent/child class, I won't have to wait three years before my girl can start CrossFit Kids! Some affiliates do do this and Brand X has had some one-off special event parent-child classes while not offering them on a regular basis. Instead they run a very successful pre-school program which is the cutest thing to watch. Ask CF Kids HQ if there is an affiliate with a pre-school program near you. and one of the pre-school kids being used as a demo girl at a kids cert in this video http://journal.crossfit.com/2009/10/crossfit-kids-certhighlights.tpl at about 2:31. That little cutey was pretty much the reason for the pre-school class kicking off and she's now moved up to the CF Kids program. Wow. Thanks very much, Craig, for directing me to those videos. The vision that the Martins have for kid-fitness completely coincides with my own. I'm glad there are people like the Martins out there!! Thanks again. Worried about your kid staying up late or not eating right? You don't have to be a cop anymore. The WOD will tell the tale. You have to look for a dramatic decline in performance - like my 13 year old's this past Monday. She killed a WOD of cleans and runs before the weekend but became a sobbing mess after only a few body weight squats. Where adults can push through the effects of a sleepless night or a hangover, kids' bodies will betray them more easily, I suppose. I'm sure the science is compelling. I just enjoyed the whimpering confession as she lay on the ground. She HAD been staying up way, way late the prior few nights. I didn't even have to water-board her.